Already I am behind on catching up on blog posts to read, patterns to make & fabrics to drool over! If 2014 has the speed of 2013, I’m done for! Needless to say, I really don’t want to be late for the Jungle. Yup, if you’ve been more out of the loop than I, Jungle January is back on, hosted as ever by the indomitable AnneB from Pretty Grievances. See her first round-up post here. This time I’m making something for me! I did a bit of research back in December & found two rather cool pieces from Fabric Godmother. 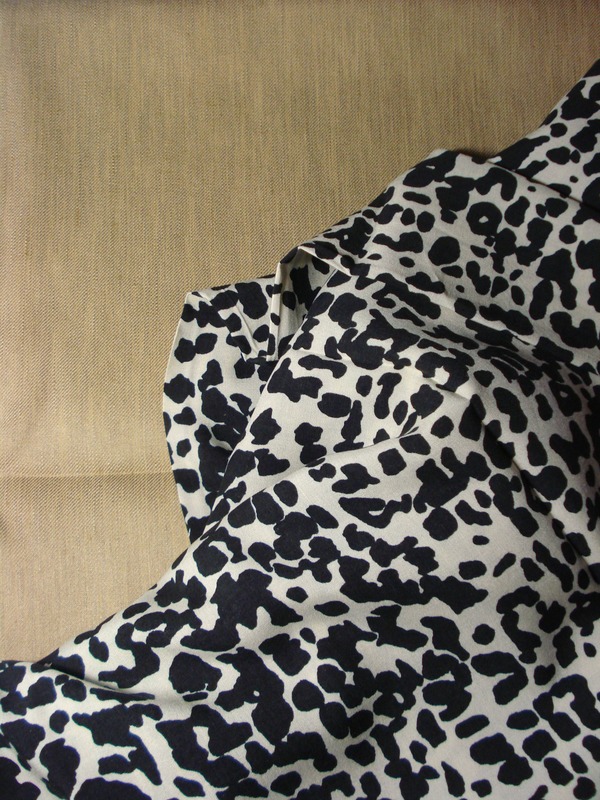 This chiffon is really pretty, as is the viscose leopard print. However, I opted for the slightly less expensive option. Ditto Fabrics have a leopard print viscose with a more monochrome colourway at £7.99/m, it will suit me better than the options with brown in them. Naturally I didn’t just get the viscose. I also bought the very last bit of a caramel linen blend for a new pair of summer trousers. Now all I need is a pattern. I really want to pattern cut something, I haven’t done any since about June last year, distracted as I have been with vintage sewing patterns! Once I’d ordered the fabric I started thinking of something drapey, possibly Pattern Magic inspired. But I kept coming back to the oversized shirt I’d made for daughter No2 last year, the shirt I made her for Christmas and the waist details common on 40s & 50s blouses. The realisation that I really wanted a “normal” blouse with a vintage hint was a relief! Until last night however, I couldn’t decide on a normal collar or a bow-tie of some sort. I’m going to compromise. I will make the blouse with a proper collar & stand and will also make a sort of neck-tie. Here’s a rough sketch of what I’m thinking so far. Now all I have to do is make the time to draft the pattern. I’ve been wanting to do a top with a sleeve & yoke in one for a while. The adaptations in Natalie Bray’s “More Dress Pattern Designing” are what I’ll be using. Fingers crossed it all goes without a hitch. If you’re joining us in the jungle, how are you getting on? I like it! Im working on a few things in snake this week. 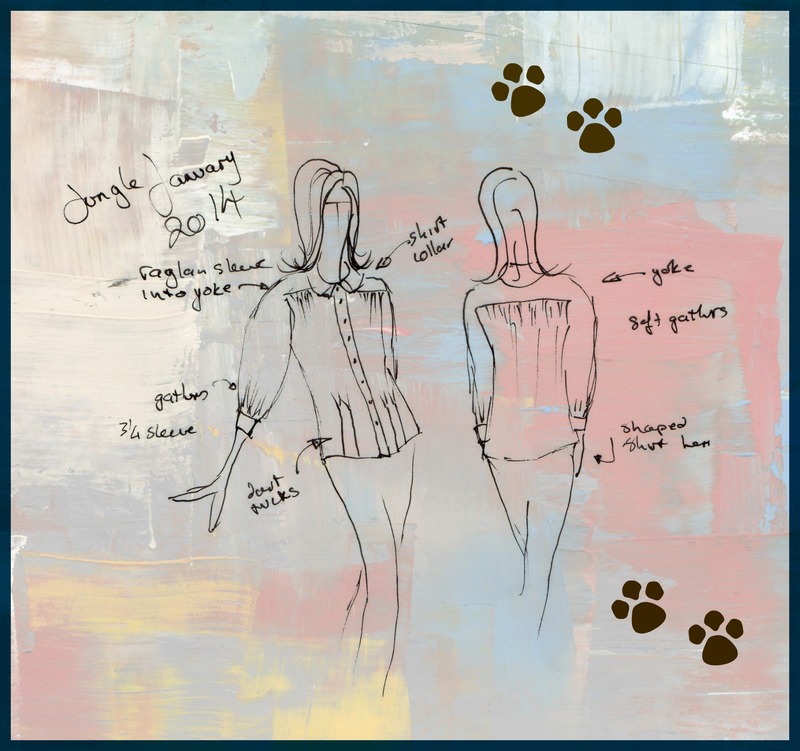 That blouse shape is so girlish- I love racy animal mixed with demure! That blouse is awesome! So flattering and feminine. I love the darts at the bottom and the gathering at the yokes. I look forward to seeing the final result!